International Life Sciences Institute (ILSI) is a front organization for food, beverage and agrichemical industries, and was founded by Coca-Cola. A recent study has found that ILSI has undermined China’s public health policies on obesity by networking with nutrition scientists to nudge “government policy into alignment with the company’s corporate interests.” Alarmingly, ILSI is also active in India, and key Indian functionaries who sit on ILSI’s board also occupy central roles in India’s primary food regulator, the Food Safety and Standards Authority of India (FSSAI). The Coca-Cola Company in India has launched a new “healthy and nutritious beverage” geared towards “active, growing children” that contains more sugar than Coca-Cola. Minute Maid Smoothie, the newly introduced beverage under the company’s “Health and Wellness” portfolio, contains 12.6 grams of sugar per 100 ml. 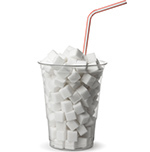 Coca-Cola contains 11 grams of sugar per 100 ml in India. The Food Safety and Standards Authority of India (FSSAI) – the country’s premier government organization responsible for protecting and promoting public health through the regulation and supervision of food safety – announced yesterday that it has entered into a partnership with Coca-Cola India to provide training to vendors “in order to ensure safe and nutritious food for all.” FSSAI’s partnership is misguided and antithetical to the food regulator’s mission, and must be scrapped. FSSAI should not enter into partnerships with entities it is supposed to regulate because it ensures conflicts of interest. Coca-Cola’s second largest bottling plant in India has shut production due to pollution violations, the India Resource Center can confirm after a visit to the plant yesterday. The bottling plant in Hapur has been under scrutiny by the National Green Tribunal – India’s Green Court – since 2015, and a number of inspections by government regulators have found the plant to be flouting environmental laws in India, and also operating without valid licenses, or No Objection Certificate (NOC). In continued troubles for the Coca-Cola company in India, a press release issued March 17, 2016 indicated that the company has stopped production in another two bottling plants in India – in addition to the three bottling plants that were shut down earlier this year. The India Resource Center welcomes new guidelines by the government of India which strengthen regulations governing use of groundwater by industries in India. The new guidelines are significant because they will apply to industries using groundwater regardless of when the industry was established. The latest guidelines could put an end to the excessive and destructive groundwater usage by industries that were “grandfathered in” under the last guidelines. As campaigners that have closely scrutinized Coca-Cola’s operations in India for over a decade, we find Coca-Cola’s assertions on balancing water use to be misleading. The company’s track record of managing water resources in and around its bottling operations is dismal, and the announcement is a public relations exercise designed to manufacture an image of a company that uses water sustainably – far removed from the reality on the ground. Activists from India and Norway are calling on Norway’s Government Pension Fund Global – the world’s largest sovereign wealth fund – to exclude the Coca-Cola company from its investment portfolio because of the company’s irresponsible water management practices in India. 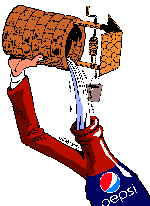 FIVAS from Norway has produced a report – Dead in the Water – that highlights Coca-Cola’s water mismanagement in India. In an extraordinary development, PepsiCo’s bottling plant in Suriyur in India has sought – and will receive – police protection for water being brought to the disputed plant located in a water-stressed area. Additionally, the Pepsi beverage manufacturing plant will also receive police protection for vehicles leaving the factory with finished Pepsi products. In a major development, the Delhi High Court has ruled that junk food – high in fat, sugar and salt (HFSS) – must be restricted in schools and a 50 meter radius. The restrictions on junk food are expected to cover schools all across India, and specifically restrict “Chips, fried foods; Sugar sweetened carbonated beverages; Sugar sweetened non-carbonated beverages; Ready-to-eat noodles, pizzas, burgers; Potato fries; and Confectionary items,” among others. Government authorities in India have declared the groundwater around Coca-Cola’s bottling plant in Mehdiganj as “over-exploited” – a category indicating the highest level of stress on the water resources. Over-exploited indicates more water being extracted from the aquifer than replenished – a highly unsustainable state. Coca-Cola’s application to expand its bottling plant in Mehdiganj, Varanasi in India has been rejected by the government, according to sources close to the India Resource Center. Anticipating that the local and international campaigns had succeeded in getting the application for expansion rejected, and in order to save face, the Coca-Cola Company has written a letter to the chief secretary of the state of Uttar Pradesh and the UP Pollution Control Board in the last week stating that the company was “not to pursue the expansion” of the plant, according to sources close to India Resource Center. PepsiCo’s announcement that the company will invest another $5.5 billion in India by 2020 – to manufacture and sell more junk food to Indians – does not bode well for the long term public health of the country. More junk food is not something India can afford, nor should it encourage. For India, a growing obesity problem is sure to further burden an already overstressed and under-funded public health system in India, as well as adversely impact the quality of life of millions. The Coca-Cola company has located one of its bottling plants in Mehdiganj, a rural and agrarian area located about 25 kms from the city of Varanasi, in east India. 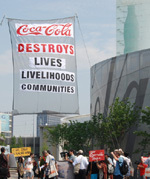 Coca-Cola’s bottling plant, which has been in operation since 1999, has severely damaged the groundwater resources in the area – both through over-exploitation as well as pollution of groundwater and the soil.